Burgess: "I am. Yes, I won't take any notice of you at all. I am now recording... I'm not in the least shy. I-I'm extremely tired." 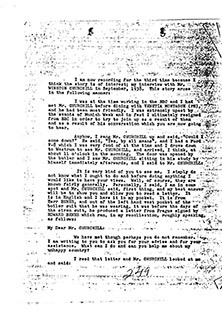 In August 1951, shortly after Burgess's defection to Moscow, the FBI became aware of the recording that Burgess had made in New York with his friend Norman Luker. 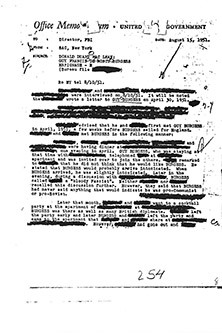 The memo, which was sent by the Special Agent in Charge (SAC) in New York to J. Edgar Hoover, the Director of the FBI, outlines the contents of the tape and conversations that the SAC had with Norman Luker. Michael Crick announced the discovery of the Burgess tapes in an exclusive report on Channel 4 News on Friday 17th January 2014. The story was also covered by the BBC Online, TV & Radio, Sky News and appeard on The Conversation. Alan Bates in John Schlesinger's 'An Englishman Abroad'. The true story of Australian actress Coral Browne who met Guy Burgess in Moscow. A dramatisation of the meeting between Winston Churchill and Guy Burgess. Written by Michael Dobbs and starring Benedict Cumberbatch as Burgess and Matthew Marsh as Winston Churchill.